The Order of Lepanto is available to perform demonstrations for parish missions, men’s conferences, parish festivals, schools, scout groups, and other venues to educate Catholics about the European martial heritage and Catholic faith. Details for a typical demonstration are listed below. We can customize our demonstrations to fit a particular audience, location, or time frame if needed. If you are interested in booking us for a demonstration, please use our Contact Form to send your request. Cost: We offer these sessions free within a reasonable commuting distance of our study groups. Events that are further away can be discussed. In addition to live demonstrations, we can also perform live instruction in the basics of the sword techniques employed in the late-Medieval and Renaissance periods. 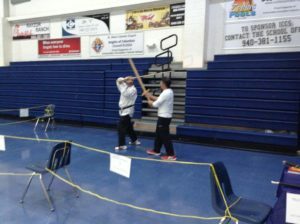 This a great way to build an understanding of the martial art, connect with historic Catholic Knights, and have fun! Cost: There is a small stipend for instructors and any travel beyond reasonable commuting distance of our study groups. Please contact us for an exact quote.